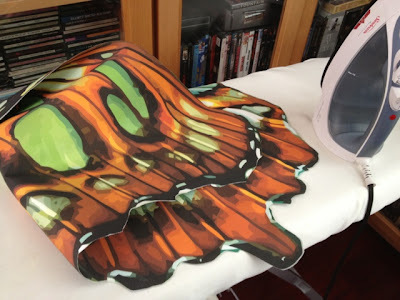 Costuming Drama: Butterfly wings are double sided! Thanks to my awesome job, which allows me to work from home on Fridays, I used my lunch hour to do some mad ironing and made all 6 of them double-sided! Then I trued up the edges and applied any missing areas with some more fray check. As you can see, they are significantly more stiff than they were. I'm hoping that that is for the better. I guess they are what they are at this point!